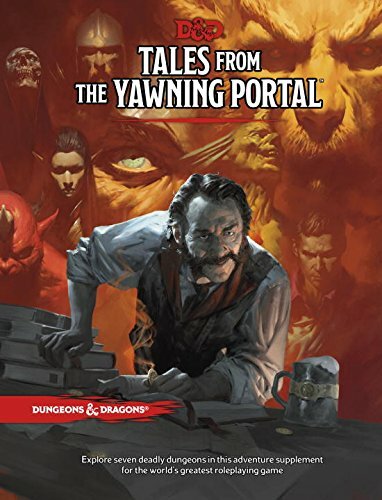 Clocking in at 248 pages, Tales from the Yawning Portal brings home 7 classic D&D adventures filled with dungeoney goodness that’s been converted for use with 5th edition. 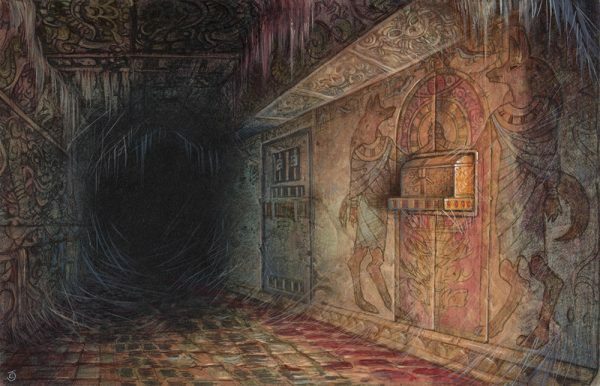 Yawning Portal offers a sampling of some of the best, and most iconic dungeons within the hobby bound in a hardback tome for use as standalone delves or as part of an ongoing campaign. It’s comprised entirely of adventures from first and third edition, with one exception, “Dead in Thay” having came from the 4e days. 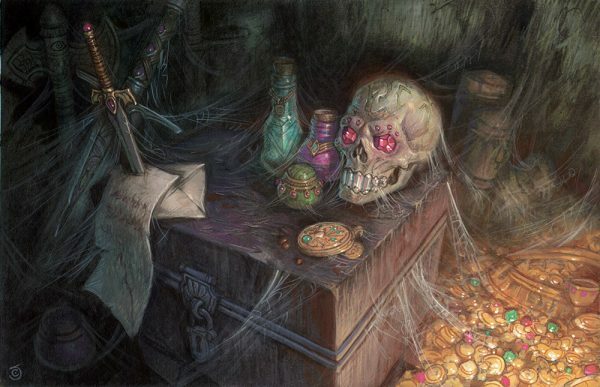 The campaign glue that tries to stick all 7 of these adventures together is the premise that player characters are within a tavern called the Yawning Portal and gather there overhearing rumors from mysterious patrons and the barkeep himself as hooks in order to seek out each adventuring locale. It isn’t the most original, but it gets the job done and the tavern cliche is honestly quite charming. You can also entirely skip this tavern premise and just run the adventures by themselves as one shots or inject them into your campaign however you see fit, they all stand entirely on their own, just as the originals did. Also like the originals, these are faithful recreations of these old adventures – no rounded corners or sharp edges filed down, they’re lethal. Let’s jump in. The book itself is as you would expect from any other offering from WotC for 5th edition, fantastic quality. There’s updated artwork for all of the adventures, an overview of the synopsis of each broken up into easily digestible paragraphs along with a brief history of the original module, and how to place the adventure into your world. The text outlines inserting the adventure into Dragonlance, Eberron, Forgotten Realms, and Greyhawk universes which is nice. Especially since this means WotC is assuming people are running Dragonlance and Greyhawk games in 5e when they haven’t released any campaign setting materials for them…yet. Regardless, these are all very nice touches. Unfortunately, this gazetteer of dungeon delves doesn’t come with poster maps. We have several adventures that have multiple large maps, crammed onto standard 8.5 x 11″ pages – it works well for reference but involves a lot of flipping back and forth and there’s nothing to plunk down on the table. Are poster maps not a thing anymore? I feel like they’ve been neglected in recent years, likely due to the popularity of digital options. Overall though, the quality of the contents is great with nice flourishes to touch up the organization of these otherwise elderly adventures. All of this nostalgia, but is it for you? During a discussion on the Pixels & Polyhedrals show we discussed who exactly this product was meant for. For those new to D&D, are they really seeking out classic adventures previous editions? For those who are already longtime players of D&D, are they really going to jump on board with 5e if they haven’t already? I mean not that redoing an old 1st edition adventure in 5e would actually accomplish that (the OSR crowd is especially impossible to please) but re-capturing an already decided demographic is hard. The answer lies somewhere in between I suppose. It’s hard to say what the true target audience is, but that’s irrelevant because I’m going to venture to say that Tales from the Yawning Portal captures all of them at least in some capacity. 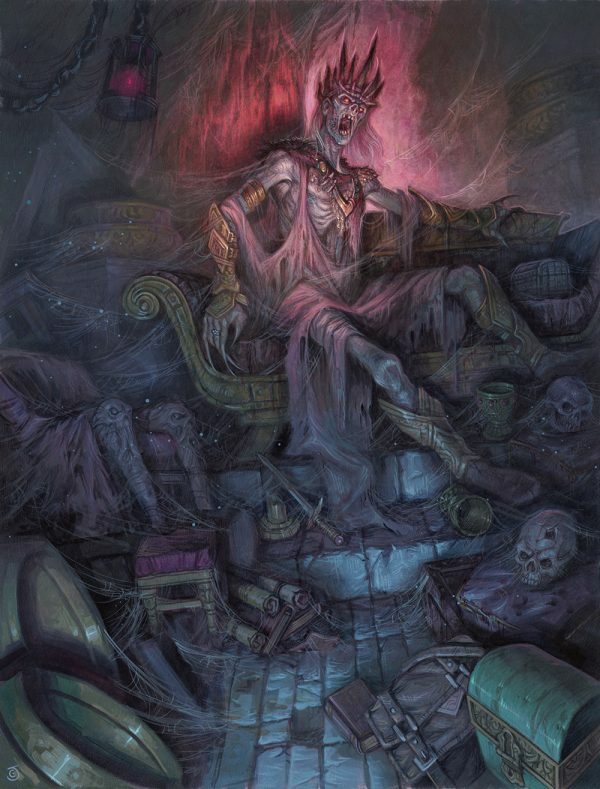 While I’m not new to the game, and not some OSR grognard, but also not entirely nostalgic of these adventures having never played the originals (beyond Tomb of Horrors and Tamoachan conversions for 4th edition) it sure did capture my attention. Part of the reason it grabbed me was a bit of nostalgia, sure, but also for seeing more published adventures take the route of “this is hard and you’ll probably die”. I’m a big fan of punishing adventures and games, in case you haven’t figured that out by now. I’ve blathering on about it here for 7 years. Yawning Portal offers a solid 7 adventures for an entire range of player levels and each of the adventures is mostly dungeon crawl , which is absolutely the best part to me, everyone that can enjoy a good dungeon crawl that is. Wait. Are there people who don’t enjoy dungeon crawls? Surely such people don’t exist, there are two things I’m certain of in life and that’s that everyone enjoys a good dungeon crawl, and also pizza. Disliking either of these things will undoubtedly make me question your humanity. Speaking pizza, (which is often served in taverns…awkward transition time!) let’s talk one final thing, this campaign backdrop situation. The Yawning Portal is a tavern within the city of Waterdeep, in the castle ward to be precise, and it serves as a quest hub/backdrop for those who wish to use it as one. The book goes on for several pages outlining how to tie all of these adventures together using the tavern such as how players might interact with Durnan, the tavern’s keeper, and other minutiae of the adventuring in-between times. The option to run the entire book front to back as a continuous level 1 to 20 campaign is something we haven’t seen in a while, if ever. Starting out plumbing the depths of the kobold-riddled Sunless Citadel and ending with the players taking the ultimate test in attempting to survive Acererak’s Tomb of Horrors is quite a genius, encapsulating premise for a D&D experience if you ask me. 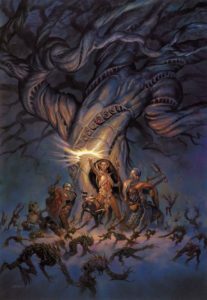 Sure the tavern setting is cliche and overdone, but these are classic D&D adventures, it might feel wrong if they were presented in any other way. Any GM worth their salt doesn’t really need the glue of the tavern to tie it all together, but I’m glad it’s there, and again I don’t think I’d have done it any other way myself. I think it takes D&D and puts the meta-game of the universe itself and puts it on display, potentially in an almost episodic format. 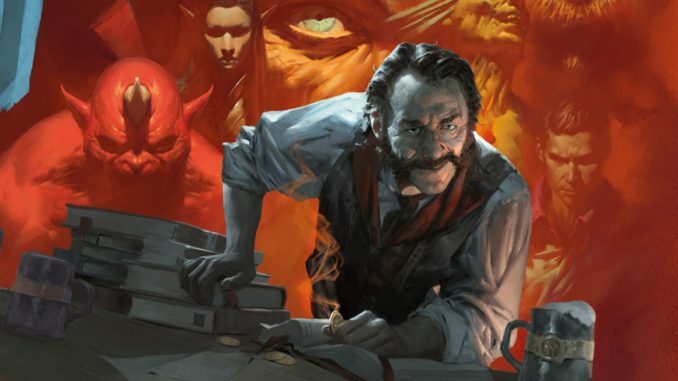 It goes without saying that Tales from the Yawning portal is a great book to add to your D&D library, especially if you’re a fan of dungeon crawl style adventures, no nostalgia required. You can grab it on Amazon for $30 which isn’t bad, especially if you plan on putting all of the adventures to use. My only real gripe is that I wish it came with poster maps, though I’m sure that would have added to its cost considerably and not everyone wants them. Perhaps we’ll see a map pack in the future? Regardless, this one is totally worthy of being at your table. Until next time folks, game excellently with one another!